Smythy posted an interesting comment on my first Northrend tanking experience. I mostly heal in raids or with the other Munquis so letting players die intentionally isn’t an option, but yeah, once in a blue moon I pug. And yeah, when I do I often see DPS pulling aggro. It never occurred to me before that letting them die was a sensible option, I’d always thought it was something you did when you were feeling particularly narked. But maybe letting them die really is the only way they’ll learn. And as Smy says, it will probably only make the trash take longer and not actually cause a wipe. Getting ready to run away. 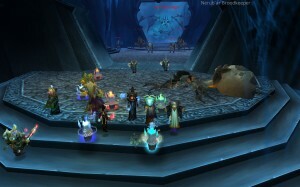 The munquis went for the first Icecrown Citadel raid last night. 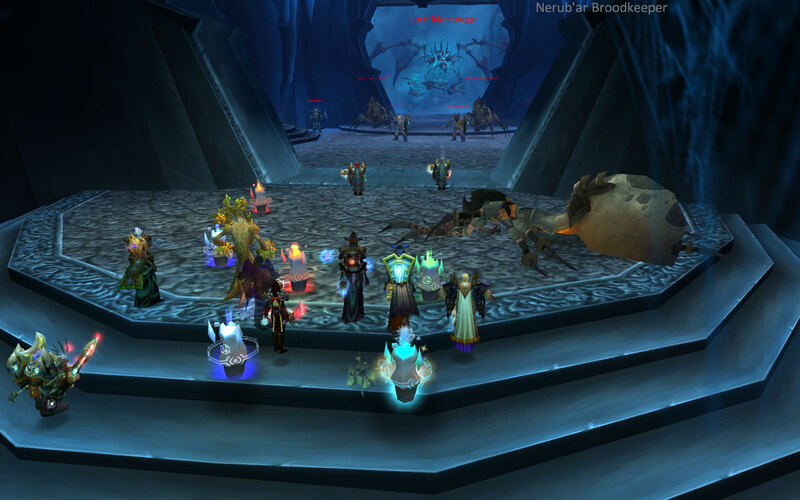 After an interesting issue with Phasing where no one could see anyone else – making summoning particularly difficult, stuff we gathered together inside the instance and started on the trash. There’s a fair bit of trash, which gives you plenty of time to hear the voices acting out bits of the current lore. I quite like this, usually the lore is only there if you bother to look for it, here you don’t have to go looking, it comes across as a natural part of the instance, not glued on. Well Done Blizz. The trash in here can be a bit tricky, but not too difficult. There’s a couple of times when you trigger some enormous “Bone Wasters” just as you engage a new pack, fortunately these seem to be “tied” to an area and will de-aggro if you run away far enough. The second time we came across the Bone Wasters was especially memorable. There we were all setting up, wondering if we’d aggro the Bone Wasters on the next pull. The tanks agreed that if we did aggro them we would run away until they reset. Plan made. Everyone is ready, pull starts and, not unexpectedly, the Bone Wasters wake up and come out of their niches. Half the ranged/healers turn and start running towards the entrance. Over Vent we hear “It’s all right, we’ll tank them here”. So we all turn around and start running back in range to heal. The tanks die because there aren’t enough (any?) healers in range! So we got back just in time to turn around and run away again! If my Vent weren’t on Push-to-talk I’d have been muted, just so they didn’t have to put up with me laughing my head off continuously for ages. I’m still smiling now just thinking about it. Best pull I’ve been on! Ever! Even more memorable than the “heal me” incident in Naxx. Anyway, the first boss was a bit too much for this team so we went and cleared Trial of the Crusader in the remaining time. A couple of wipes, but pretty damn good. Especially for Flowersz because she got some Healing gear and some offspec Enhancement gear. The place is already heading to Farm status. Sue was visiting a bunch of news sites the other night, visit this site trying to find something or other about Strictly Come Dancing, when suddenly a notepad window popped open with random looking text in it, starting with the dangerous MZ characters and including some text or other about “this program cannot be run in DOS mode”. Simultaneously Kaspersky popped up saying it was putting “CriticalUpdate.exe” in the low risk group. We’re pretty sure one of the sites had managed to shove a trojan/virus on her computer presumably using vulnerability in Firefox or one of the essential addons (Real Player, Flash or somesuch). A full scan with Kaspersky found two highly suspicious files with its heuristics analyser but they had later dissapeared from view! More than a little suspicious. I’ve managed to find 4 really iffy looking files, two tmp files containing executable code and two executables lsass.exe & CriticalUpdate.exe. I’ve stuffed these into a zip for later investigation. The thing is Kaspersky doesn’t see them as dodgy! Not even when I check them on my presumably uninfected machine. I’m dissapointed. Until Kaspersky can see these files as bad we can’t assume that the machine is not badly infected. It’s looking like we’re going to have to wipe her notebook and start afresh. Which is difficult because it doesn’t have a built in CD drive or standard Windows XP installation CDs. So now I know that Kaspersky isn’t quite as solid a defence as everyone pretends it is. I’m particuarly annoyed that it blithely accepted lsass.exe as low risk when it wasn’t even in the System32 directory! If Sue hadn’t previously associated .tmp files with notepad we probably wouldn’t even have noticed anything! Boo! Then again, maybe I’ll get to play with Windows 7.